Virgin TV Anywhere launches on web, mobile and tablet | What Hi-Fi? Virgin Media is today launching its TV Anywhere cloud-based entertainment service, at no extra cost to all Virgin TV subscribers. 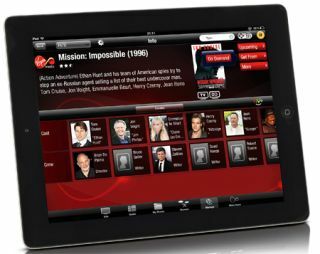 A TV Anywhere app for iPad and iPhone is available now and the Virgin service is also accessible via the TV Anywhere website. The service enables Virgin customers to stream live TV, with up to 45 channels to choose from at launch, depending on their TV package and method of access. Customers will be able to access Virgin TV Anywhere through the web, or mobile or tablet if they have a Virgin TiVo box. The online service is available to all Virgin TV customers, with extra features for TiVo users to manage their set-top boxes through tools such as remote record and managing 'My Shows'. The mobile and tablet app, initially available on iPad, iPhone and iPod (and with Android to follow in 2013), offers the ability to fully manage TiVo boxes including scheduling recordings and deleting shows. The iOS app is avaialable now on iTunes. Virgin is taking the battle to Sky and looking to free further your TV from your living room with the launch of a Virgin TV Anywhere. The new service will deliver live TV and video-on-demand content, and it will give you the ability to manage your set-top box in the form of a new look website and a brand-new app. The Virgin app aims to bring the TiVo experience to your PC, laptop, smartphone or tablet, allowing you to browse the EPG, manage your recordings and change channels without affecting the image on your TV screen. And if you can't agree on what to watch, you can stream content straight to your portable device for a multiscreen TV experience. Due to launch in Autumn 2012, Virgin TV Anywhere is free and, theoretically, available to all Virgin customers. While any Virgin customer can access the new look website, the live TV and on-demand content that you can access will depend on your choice of Virgin TV package. The added extras via the website, such as setting your box to record, managing your recordings, and social aspects such as liking certain content will also be exclusive to Virgin TiVo customers. The new Virgin TV Anywhere app will also be for Virgin TiVo customers only, bringing the sort of functionality familiar to Sky customers with the Sky Go app to Virgin TiVo users. The TV Anywhere app will launch on iPod touch, iPhone and iPad in Autumn 2012, though an Android app is in the pipeline for 2013. You'll need a wi-fi connection to watch content, though a 3G offering is on the wish list. Also on the to-do list is the ability to watch your own personal recordings stored on your TiVo box on your tablet or smartphone. Clever. It's a big push for Virgin in to the mobile TV domain, and the company is bullish about the advantages of its own service when compared with Sky's. Virgin has been doubling its customers' broadband speeds and fibre optic network speeds of up to 100Mb help ensure stable streaming to other devices in your home, while the TiVo box has its own dedicated 10Mb connection for streaming content, ensuring it won't throttle speeds elsewhere.